Class was fast paced today. We had one minute rolls for the majority of class in various positions. We paired off and started in guard, switched positions after a minute and then went to side control, back control etc. Then we had people get down in the center and if you were swept, reversed or submitted then you were out. Near the end of class we rolled until the other person tapped out. My first roll lasted with Justin, a Blue belt who takes about 8 to 10 classes a week. He caught me with a triangle while in mount at the end. Jeff, another Blue Belt caught me in a Kimura. Not my day, but at least I can say I am not worried about a lower belt tapping me out. I wondered about that before I was promoted, but it was just like any other day. I do need to continue to work on my endurance though. I could feel my resolve leaving me near the end of class and I was being sloppy with my defense. This entry was posted in BJJ, Grappling, Jiu-Jitsu, Jiujitsu and tagged BJJ, Brazilian, Grappling, Jiu-Jitsu, Jiujitsu, Wrestling. I am late as usual, but I bumped into a video of Combat Jiu-Jitsu. It has been sanctioned by the California State Athletic Commission and was created by Eddie Bravo. The catch to the the grappling is that you can strike when on the ground. Bravo said it’s for all those fantastic grapplers who, for some reason, don’t want to learn an entirely new skill set, but want to add a level of realism to their grappling game. He also claims it can be a gateway for grapplers (of all stripes) to ready themselves for MMA. It’s interesting, but admittedly, I don’t know what to make of it. This entry was posted in BJJ, Brazilian Jiu-jitsu, Eddie Bravo, Grappling, Jiu-Jitsu, Jiujitsu, Judo, Mixed Martial Arts, MMA and tagged BJJ, Brazilian Jiu-jitsu, U MMA. Promoted to Purple Belt! Yeah Baby!!! 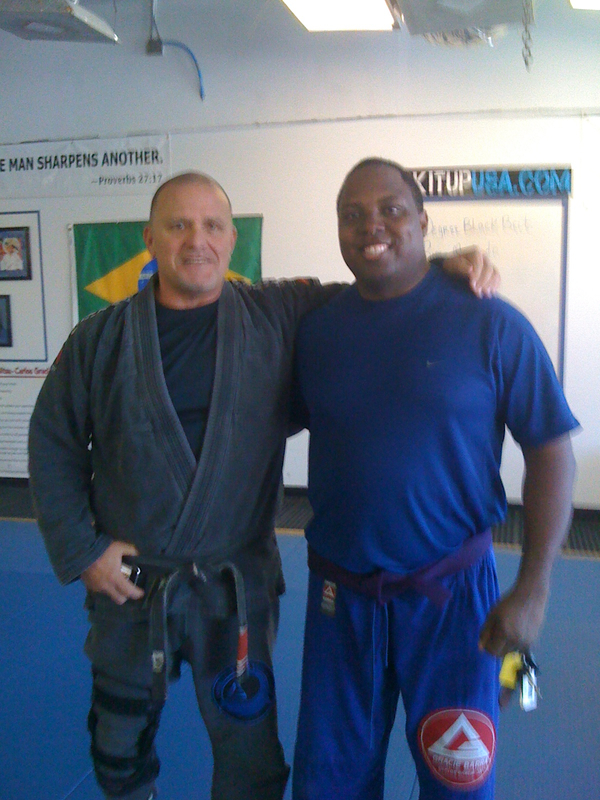 Prof Shealy Promotes me to Purple Belt! It was a beautiful setting. I couldn’t ask for a more idyllic scene to receive my Purple Belt. 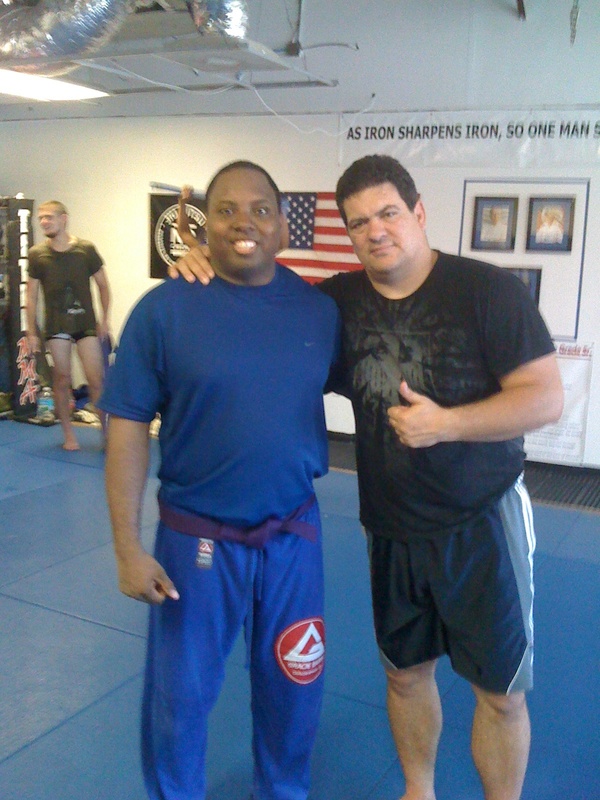 Today we held a seminar with Rigan Machado; BJJ legend and 8th Black Belt. Two of the first books I ever bought were by Machado (Encyclopedia of Brazilian Jiu-Jitsu I and III). 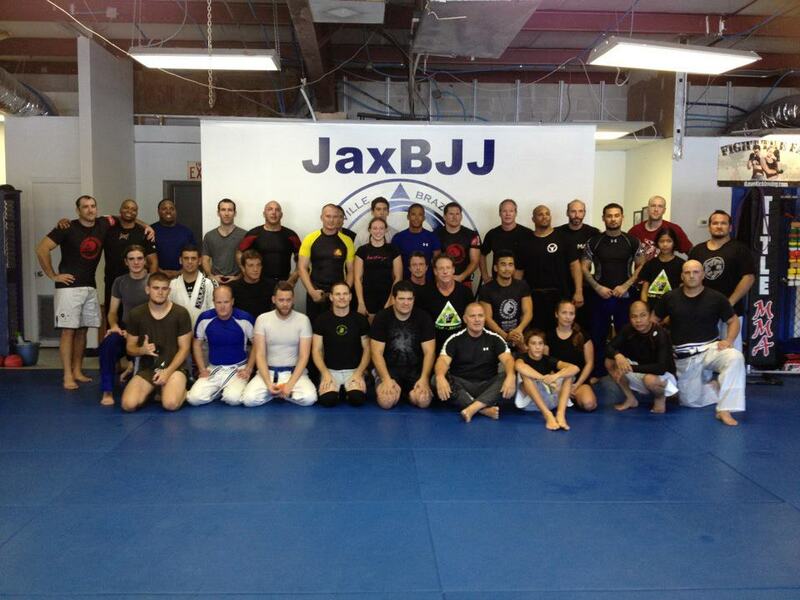 There were about 50 people in attendance, many of whom I have trained with for 2 years now. Professor Shealy started off by saying there were some people he wanted to recognize and then he started calling us up. Jason Dominguez received his Black Belt. I was called up second and received my Purple Belt. Prof handed Master Rigan Machado the belt and then Machado took off my Blue Belt and tied the Purple Belt around my waist. I was all smiles while it happened and really appreciated the applause afterward. Not for vanity’s sake, but because I have trained over and over with these guys and without them it wouldn’t have been possible. I trained for a year in judo in the late 90s, started no gi in 2004 and began training with the gi in 2008. I have moved often due to my career and didn’t receive my Blue Belt until Feb 2009. Since that time I have trained in two different academies. In other words, it took me 8 years to earn a purple belt. Even though I have a million excuses, I am finally glad that I have a permanent BJJ home that I can grow in and progress. Some people probably dismiss the idea of BJJ being a marathon and not a sprint as a banal statement, but it is truly a journey and I have appreciated every step! Note: Now I don’t have to watch the Roy Dean Purple Belt Promotion videos with longing for the day when I reach Purple Belt. — Instead, I can watch the Brown Belt vids. It’s not over! Ouss!!! This entry was posted in BJJ, Brazilian Jiu-jitsu, Grappling, Jiu-Jitsu, Jiujitsu, Judo, Purple Belt, Roy Dean, Uncategorized, Wrestling and tagged BJJ, Brazilian Jiujitsu, brown belt, Jiu-Jitsu, Promotion, Purple Belt, Rigan Machado, Roy Dean.